Solar powered backpacks are useful for everyone. Planning a camping or hiking trip? Now you can keep your camera, cell phone and GPS charged. 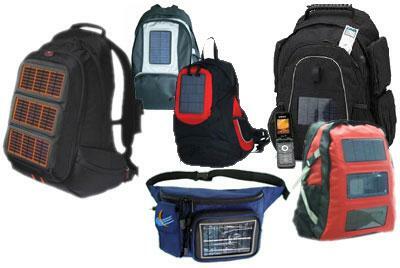 Students on campuses around the world can use solar backpack to recharge computers while they trek across campus. Any exposure to UV light will activate the solar panel. Plug in our devices in the built-in ports in the bag and you’ll never worry about the batteries running out. Now, you don’t have to feel like you are compromising “cool” design for practical uses. We are offering a solar powered backpack with an exceptionally luxe lifestyle apparel and innovative athletic gear.It is available in various colors and design. Contact us and see our brochures.